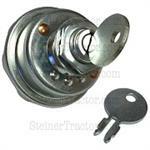 JDS583 OEM Ignition Switch / Key Switch W/ 2 Keys This switch has 6 spade terminals and 5/8" - 32 UN threaded stem size. 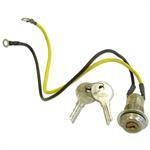 JDS828 OEM Ignition Key Switch includes 2 keys This is a genuine Cole Hersee switch. 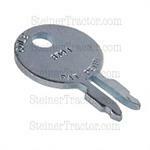 They are the OEM manufacturer. 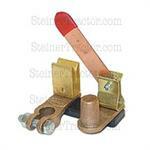 This switch has 6 spade terminals and a 5/8" - 32 UN threaded stem. 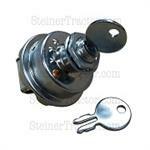 ABC398 Universal 2 Position Push Pull Ignition and Light Switch The knob measures 10-24 NC thread pitch. The threaded stem measures 3/8 - 24 UNF. ABC233 Universal 2 Terminal Switch Can be used as Universal 2 Terminal Starter Switch | Ether Switch | Horn Button | Manifold Preheat Switch. Mounting stem measures 5/8" 32 thread, 21/32" long. 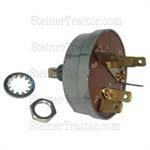 JDS3216 Ignition Resistor for Combination Starter Light Switch 0.8 ohms resistance. This resistor is necessary to protect the coils in the JDS103 pony distributor and attaches to the combination switch. ABC489 Magneto Push Pull Switch This switch has 1 screw type terminal. This switch will fit most models with a magneto ignition. The threaded stem measures 3/8 - 32 UNEF. JDS844 4 Position Light Switch This is a genuine Cole Hersee switch. They are the OEM manufacturer. 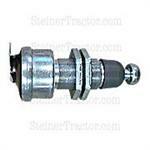 This switch has 6 spade terminals and a 5/8" - 32 UN threaded stem. JDS846 Light Switch Knob 2.244" O.D.